Happy National Spicy Tuna Day! Here at Geeks Who Eat, we adore sushi! We love finding new sushi places to try and have even learned how to roll it ourselves! While we love traditional sushi and its western counterparts (ie: California Rolls and Spicy Tuna Rolls), we wanted to explore some of the more extreme and unconventional types of sushi rolls (especially since International Sushi Day is coming up on June 16th). With our mission in hand, we set off to Stingray Sushi to explore the world of specialty maki! 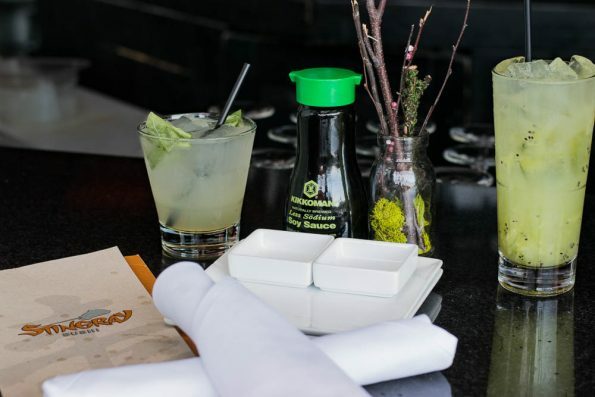 Wanting to leave conventionality behind, we decided that a traditional sake and miso soup or edamame would simply not do. Instead, we opted to try a couple cocktails: Tokyo Stock Exchange and Kiwi Collins (Tito’s Torani Ginger, Basil, and Lime; Pineapple Vodka, Fresh Kiwi, and Lemon Juice topped with Soda) and at the suggestion of our server Michael, the Snow Crab/Mozzarella. Both cocktails were excellently executed and are perfect for the upcoming summer months where you want something light and refreshing. The Snow Crab/Mozzarella is basically a wonton wrapped crab and mozzarella stick served with a spicy aioli. We were initially hesitant because mozzarella sticks are typically kind of blah. 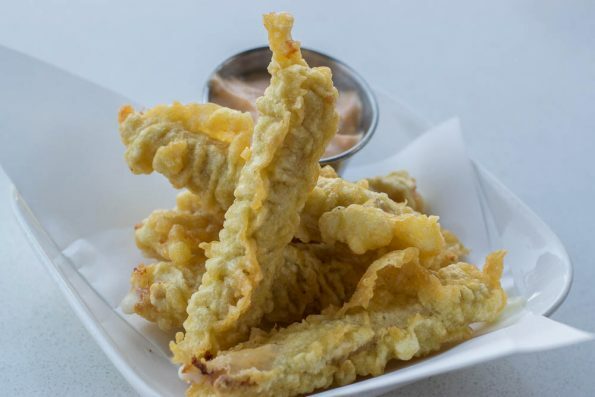 However, we were glad we listened to Michael because the addition of crab and use of the wonton wrapper creates a whole new experience that is quite different than a traditional mozzarella stick (see what we did there?). 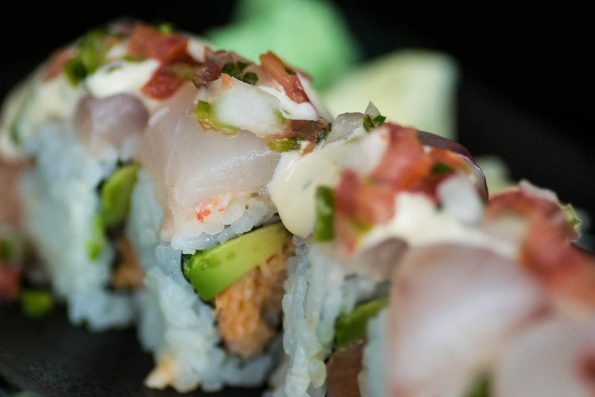 Cabo Blanco Roll (salmon, spicy crab, avocado, halibut topped with pico de gallo and creamy ponzu)- Fish taco meets sushi is the name of the game with this roll. The creamy ponzu and pico de gallo are so reminiscent of a fish taco’s topping that you might momentarily forget that you are eating sushi. Our server Michael also suggested using a bit of sriracha while eating them and after trying it his way, we never looked back! 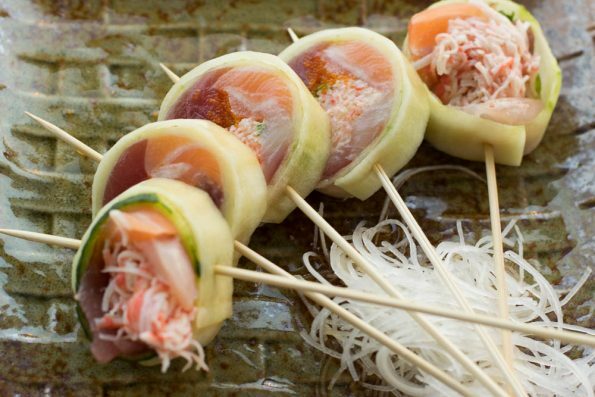 Original Lollipop Cucumber Wrap Maki (tuna, salmon, whitefish, crab mix, masago and scallions wrapped in cucumber with ponzu sauce)- Replacing traditional rice and nori with cucumber, the Original Lollipop Cucumber Wrap Maki is a fantastic low carb option loaded with flavorful fish! Slightly awkward to eat (think chirashi on a stick), but well worth the effort, this roll is perfect for summer and those looking to leave rice behind. 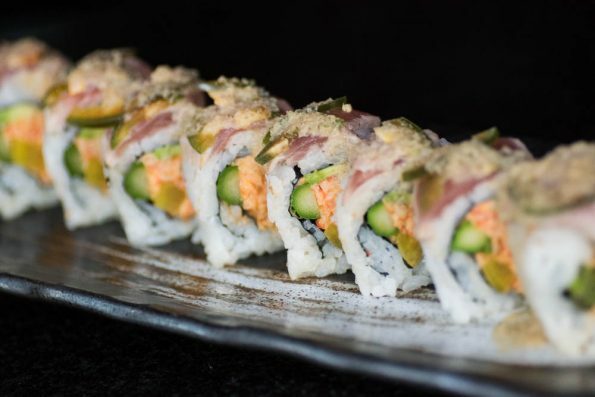 The masago adds a welcome crunch and saltiness to this beautiful maki. 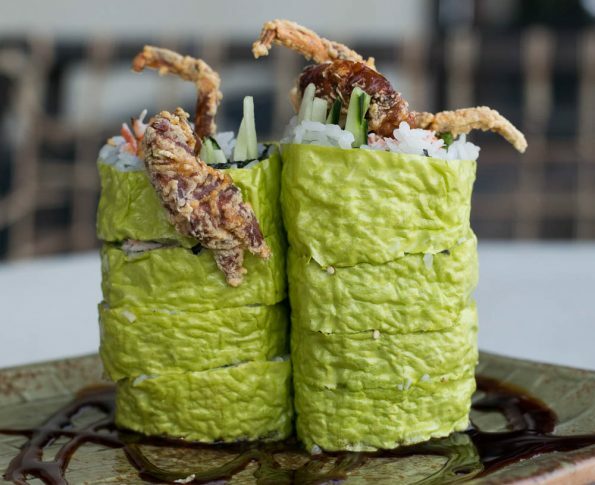 Morning Dew Soy Paper Maki (shrimp tempura, spicy crab mix and avocado)- The Morning Dew Soy Paper Maki is basically a Shrimp Tempura Roll that uses soy paper instead of nori. This roll is a great starter roll for someone looking to explore sushi without getting into the overly “ocean-y” flavors. 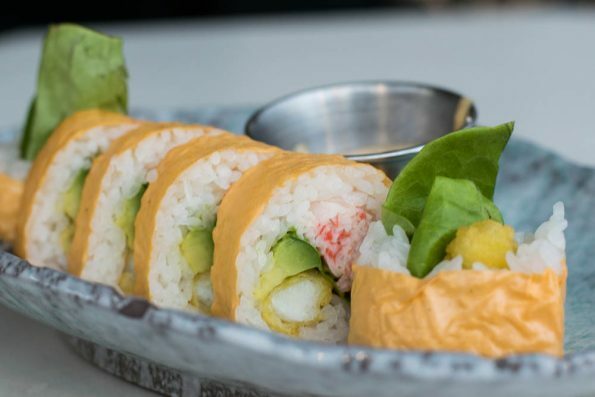 The lack of nori and tempura battered shrimp tone down the typical seafood flavor, making this roll sort of a shrimp po’boy of sushi rolls. It is also worth note that Stingray Sushi has some of the best crab mix we’ve ever had. Often overlooked, yet integral in westernized sushi, crab mix is easily over saturated with mayo. Stingray Sushi avoids this faux pas and serves theirs with perfect flavor and consistency making it the unsung hero in all of the rolls featuring it. The great thing about sushi is that there is something for everyone (heck, even people who don’t like seafood can typically find something to enjoy). So we want to hear from you! Where do you like to go for sushi and what is the wildest roll you’ve ever had? Leave your comments below or use the hashtag #GeekEats!